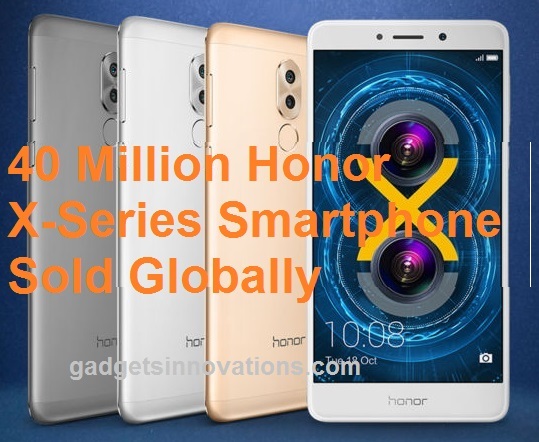 Honor, a leading Smartphone e-brand, announced on its 4thAnniversary that Honor X series, including Smartphones from Honor 4X to Honor 7X, achieved overwhelming sales performance with over 40 million units sold in the Global Market. Honor X series offers latest premium features at an accessible level for users Worldwide. The latest Honor 7X demonstrates this commitment by marking a successful global debut of the latest bezel-less Smartphone which offers great value to consumers. Honor 7X boasts an 18:9 edge-to-edge, bezel-less screen which enhances viewing and gaming experience significantly. The new flagship device is powerfully configured to perform seamlessly, making it an ideal companion for users whenever they work, communicate and play. Honor 7X launched in China in October 2017, and is also made available to users worldwide recently. In China, the new smartphone achieved remarkable sales results during "Singles' Day", the most important annual shopping festival, on 11 November this year. 300,000 units of Honor 7X were sold within the first two hours of Singles' Day on Tmall.com, China's largest online retail platform operated by Alibaba, making the smartphone at the top of overall bestsellers in the price range of RMB 1,000 to 1,999. In India, Honor 7X received overwhelming response from consumers. Three rounds of flash sales with limited number of Honor 7X were announced in India right after the global launch, and 20,000 units were sold out in one hour of each flash sales. In Russia where Honor is a top-three smartphone brand, the sales of Honor 7X was triple that of Honor 6X in the first two weeks of the global launch, accelerating the already strong momentum in the country. In the United States, Honor 7X achieved a 250% growth in pre-paid orders from 5th Dec to 14th Dec compared to the sales of Honor 6X during the first 10 days of its debut. The smartphone is also available for purchase in selected markets, including Europe (United Kingdom, France, Germany, Italy, Spain, Poland, Ukraine and Turkey), Russia, United State, Middle East (United Arab Emirates, Saudi Arabia and Iran), India and Malaysia. With an unparalleled full-screen viewing experience at an extremely competitive price point, Honor 7X wins supports from consumers across the world.